Everett Collection Jimmy Stewart in Vertigo, 1958. Stars: James Stewart, Kim Novak. Jimmy Stewart suffers from high anxiety in what some consider to be Alfred Hitchcock’s greatest film. At the risk of sounding slow-witted, I must complain that Alfred Hitchcock’s Vertigo was a little too difficult for me. I had to concentrate so narrowly on the labyrinth of the plot that I never broke out in the cold sweat which is the emotional reward of a good thriller. Even so, I’m not sure that I could successfully diagram the evil stratagem. Mr. Hitchcock is employing in this film an impressionist manner which is the last word in whodunit sophistication and which relieves the storyteller of the need to demonstrate that the time schedule will work, that the corpse will keep its secrets, or that the various gulls will indeed assume what they are intended to assume. In the end, it is not a murder that inspires entire confidence. This may sound finicky—who cares about the plausibility of The Lady Vanishes? But Vertigo belongs to a less innocent school of hocus-pocus. The story is the work of Pierre Boileau and Thomas Narcejac, who also provided Clouzot with the plot for Diabolique, and these two fabricators operate in the area of up-to-date psychology. So the spectator is encouraged to ask not only could it, but would it happen. You undoubtedly care more about the people in this picture than you do about the inhabitants of most thrillers, but for that very reason you may the more sharply resent the contemptuous way in which they are twitched through their adventures. 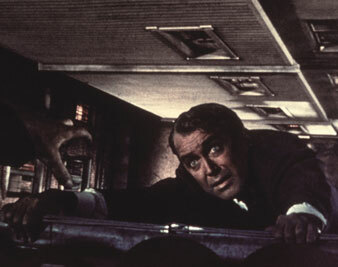 Vertigo is not as cruel a picture as Diabolique, but for Hitchcock it is surprisingly cruel. On the credit side, the picture moves rapidly through some pretty San Francisco and Northern California coastal scenery, and James Stewart carries out his detective and romantic assignments with easy grace and warmth. Kim Novak is excellently eye-catching in costumes a size too small for her; she seems stultified, but the plot calls for repressed behavior and I could not tell whether this was a case of good acting or good casting. Barbara Bel Geddes is given an important and faintly sinister role with horn-rimmed glasses; this comes to nothing, however, and that sort of false emphasis is a real defect in the game of crime chess.